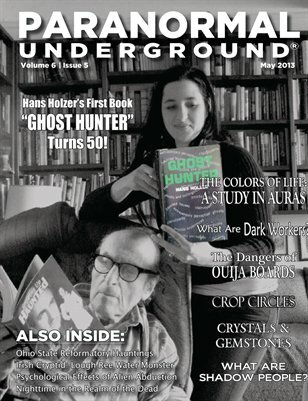 In this issue of “Paranormal Underground” magazine, we profile Hans Holzer and Alexandra Holzer, as well as “The Scent of Freedom” author Mhairi Simpson. We also feature the Ohio State Reformatory, crop circle conspiracy theories, dark workers, crystals and gemstones, and an in-depth look at auras. Other columns discuss the dangers of Ouija boards and other spirit communication, what shadow people are, the psychological effects of alien abduction, and the haunted Country House in Illinois. This issue also explores the Irish cryptid Lough Ree water monster, the amazing Daniel Dunglas Home, and nighttime in the realm of the dead. Join us as we Explore the Unexplained at www.paranormalunderground.net!